Start off the New Year with a wardrobe as warm and tranquil as your surroundings. 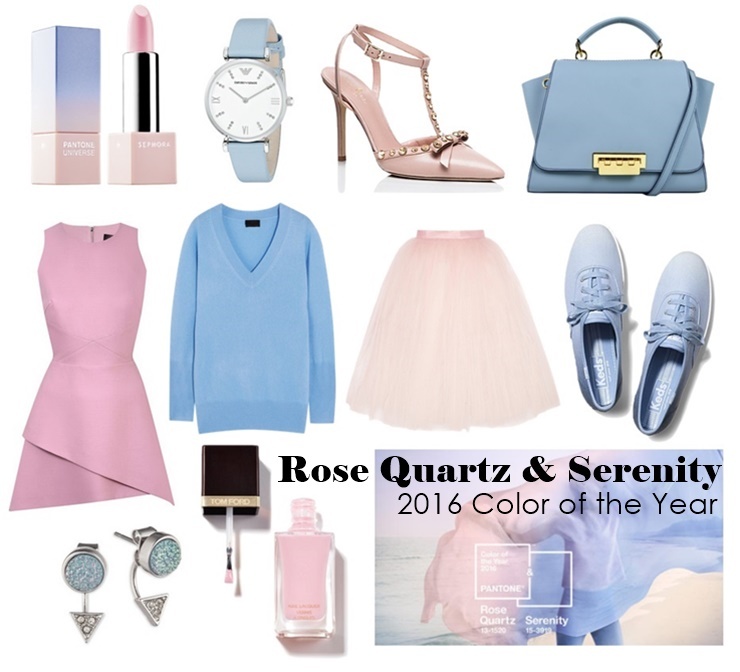 For the first time ever, Pantone named two shades, Rose Quartz (a delicate blush) and Serenity (a tranquil blue) as the Color of the Year. The colors are meant to reflect our newfound penchant for harmony and wellness as well as a soothing sense of order and peace. Whether you agree if we should have a color authority dictating what we wear or not, one thing is for sure – the colors sure are pretty! I don’t know about you, but I’m loving the soft cotton-candy hues. Sure, it may be reminiscent of nursery colors, but these beauty and fashion picks are all delightfully grown up. Pantone always does such a great job on choosing the color of the year and you made some great choices on how to incorporate the colors of the year into your life and wardrobe! that PINK tutu skirt is to DIE for! i love it! thanks for linking up.